After a stint as a newspaper reporter, and serving in the U.S. Army during World War II, Martinson changed careers and became a television director. In the 1950s he worked on episodes of Cheyenne, the General Electric Theater and The Roy Rogers Show. In the 1960s 77 Sunset Strip, The Green Hornet, Maverick, and Mission: Impossible. In the 1970s Barnaby Jones, The Brady Bunch, Dallas, Ironside, Mannix, and The Six Million Dollar Man. And in the 1980s, CHiPs, Diff’rent Strokes, Eight Is Enough, Fantasy Island and Quincy, M.E. — among many, many more. 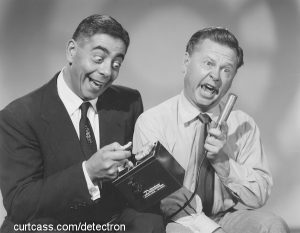 Actors Mickey Rooney (right) and Robert Strauss clown around with a Detectron DG-7 Geiger counter made by Honorary Unsubscribe honoree (and my dad) Larry Cassingham in a publicity shot for The Atomic Kid. That film, by the way, is what’s showing in 1955 at the Town Theater in Hill Valley in Back to the Future (1985). “Long before I had any real awareness of directors and their careers, I knew the name Leslie H. Martinson,” said TV and film critic Leonard Maltin. “No one who watched television in the 1950s and ’60s could have avoided seeing that name. It was emblazoned on countless TV shows.” Why did he work so much? Studios liked him because he worked fast, which saved money. Martinson also did some work in film: his debut was The Atomic Kid, a comedy starring Mickey Rooney, but he’s best known for directing 1963’s PT 109. “If you want to be a director, you can start before you’re anywhere near a set,” Martinson once said. “Every time you watch the television show, you’re learning your craft. You don’t watch a show for entertainment, you watch to study.” He retired in the late 1980s, and died at home on September 3. He was 101.